Cabrera Capital Markets has a team of highly experienced Taxable Fixed Income professionals and we consistently provide our clients with best execution in this asset class. Our expertise allows Cabrera to design and implement strategies across a broad spectrum of products consistent with our clients’ investment objectives. The Taxable Fixed Income trading desk prides itself on its execution capabilities. In these difficult market conditions, we understand the need to trade with trusted and experienced brokers who provide quality services to your firm. As a boutique firm we provide customized services to our clients by giving each trade extra attention without creating a disruption in the market place. Through our network of industry contacts we approach other financial professionals and respond with the timeliest and most accurate information providing our clients with execution and service we are proud to deliver. Cabrera actively trades in all U.S. Government-Sponsored Enterprises (GSE). In addition, we act as an underwriter for FHLB and FNMA and in new issues, callable agencies, the discount note vendor program and global benchmark debt issues. The New York Fed named us to participate in the Treasury Operations Counter Pilot Program. We focus on tailoring our efforts to meet the specific yield and maturity requirements of our clients. Through our trading and sales experience, we are able to provide customized value and added advice in the corporate and high yield debt market. We focus on locating the best value in all sectors of the credit curve and obtaining the best execution for our clients. 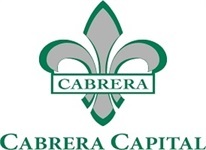 Cabrera combines experience, commitment and strong client relationships to accomplish our goals. We cover the full spectrum of mortgage products from the very actively traded to the less liquid sectors. We are involved in all aspects of secondary CMO trading.